A soon-to-be-released study set to publish next month in Public Administration Review titled “Will More Black Cops Matter?” reveals something that may be counter-intuitive to most people, with the possible exception of most 16-to 24-year-old Black males in urban America: Hiring more Black police officers will not prevent or reduce the number of police shootings of Black people. The Washington Post, through its own investigative study, found that in 2016, a “disproportionate number of those killed in police-related shootings were Black, whether or not the victims were armed. When adjusted by population, African-American males were three times as likely to be killed by police as their white counterparts. … Thirty-four percent of the unarmed people killed this year were Black males, although they make up just six percent of the population.” White officers are still the primary shooters of Black people. The reason for this conclusion, researchers believe, is because when there are only a few Black officers on a police force, those officers will work extra hard to fall in line with the prevailing police culture, where it is “us vs. them.” Another study, titled “Black or Blue: A Study in Racial Profiling and Representative Bureaucracy” by Vicky M. Wilkins and Brian Williams, both at the Department of Public Administration at the University of Georgia, found that Black officers disproportionately profile and arrest Blacks at higher rates than white officers. This changes, however, when Blacks make up more than 40 percent of a local department, which may make the recruitment of Black officers a viable option for reducing violence and shootings of Black people. The 40 percent threshold seems to suggest that once there is a significant Black police population, that these officers feel less afraid to challenge assumptions on Black criminality. The Black officers also achieve ranks that allow them to tweak policing policy at the precinct level, which supports a reduction in shootings and violence. However, in cities where Blacks are a minority, it’s not practical and doesn’t address the root causes of violence and murder of innocent Black people by police, whether they are Black or white officers. In a country founded on and still fueled by white supremacy, where Blackness is seen as a sign of inferiority and brutishness by the white majority population, a view too often shared by Black people, this study confirms anecdotal evidence that the treatment at the hands of Black officers can be just as brutal as their white counterparts. The culture of belonging for Black officers often outweighs morality and/or ethics, and the continued desire for acceptance by white police officers has played a dominant role in the mental state of the Black officer as an individual and proven more powerful than racial allegiance. Black officers in Black neighborhoods often seem the equivalent of Bantustan police in apartheid South Africa, keeping Black people in their place and never examining the context in which policing happens in America. The Black officer often parrots the conservative rhetoric of his fellow white officers of feeling endangered by Black criminality and seeing the cause of poverty to be absentee fathers or unwed mothers. These officers often lack an analysis of their own as to how poor Black neighborhoods are created and they become open ciphers for white group-think on the causes of crime and poverty. 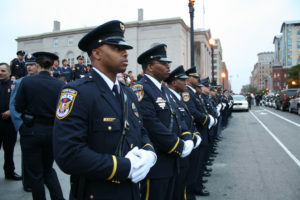 Although the data show some improvement with larger numbers of Black officers on the force, what it does not point out is that Black-led police forces continue to enact the most conservative responses to “fighting crime.” In Atlanta, for instance, Mayor Kasim Reed and recently retired Police Chief George Turner turned a blind eye to decriminalizing marijuana, which could stem the arrest of young Black males, while in majority white cities, new innovative techniques to slow incarceration by treating drug use and homelessness as social issues and not criminal acts abound. Although the study was limited to the effects of adding more Black officers on lowering police shootings, it acknowledges that policy issues can be a bigger deterrent to these shootings. The article states that policy changes are needed but does not expand further. One suggestion that has gained traction in the criminal justice field to reduce violent encounters and unnecessary arrests is decriminalizing certain drug offenses and traffic violations, which too often have become part of a payout scheme to the court system. Arrest and imprisonment takes people away from their neighborhoods and has severe repercussions for their families and communities, yet does little to prevent or deter crime. Providing programs in communities for drug and alcohol addiction, domestic violence/child abuse prevention and nonviolent conflict resolution would go a long way toward making our communities safer and changing the perspective of police officers so that they are less likely to shoot first. A more radical call, short of ending “policing” altogether, is the demilitarizing of U.S. police forces. The “us vs. them” mentality, the use of military-type weaponry, the top-down military ranking system, in addition to the racialized outlook, takes policing completely out of the hands of the very people who are being policed. Having community boards that have the power to hire, fire and penalize police in their communities would go a long way toward making people feel safer and more in control of those policing their neighborhoods, thereby making the officers more responsive to the people they police. Such a dramatic change is probably not on the horizon, however, because the political courage is not there.